Pretty much everyone on the planet has heard of SEO. But, not everybody understands what SEO means, what’s involved, and how to get started. Even more critical, too many business owners don’t know the importance of SEO for promoting their products and services. Search Engine Optimization (SEO) is simply about driving more relevant traffic to your website. SEO involves making improvements to your website to help you achieve the best possible results in the organic search engines. The goal you’re targeting is to be listed on the first page of Google. The higher up the page you’re listed – the better. When someone types their problem into Google, we want our website to be shown as the best solution. Unfortunately, getting to the top of the search engine results is easier said than done. After all, we’re competing with oodles of other businesses, all trying to do the same thing. While SEO is just one part of a holistic marketing strategy, it’s very, very important. To be honest, I think it’s the most important. So what does this mean for you? Well, if your website is listed on page 2 of the search results, or worse, chances are nobody will find you. A: On the second page of Google. 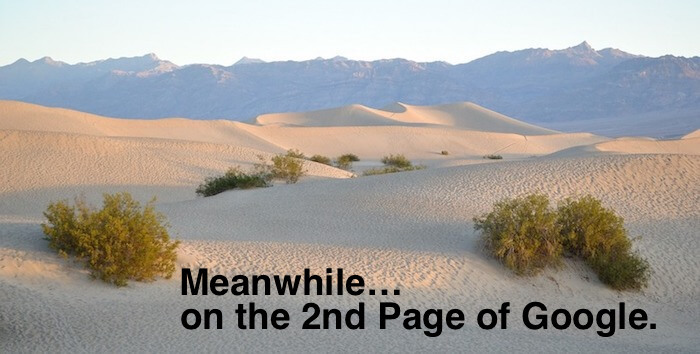 Meanwhile… on the 2nd Page of Google. Therefore, the higher you rank in the organic search results, the more traffic you can anticipate visiting your website. If you want people to find your website, you simply can’t afford to ignore SEO. The good news about SEO is that it’s a cost-efficient marketing strategy. Since SEO focuses on organic search results, there’s nothing to buy. You never have to pay Google back for any search engine love they show you. Isn’t that a sweet deal! When SEO is done correctly, it can deliver nonstop organic traffic to your website. If you were to purchase ads for that same traffic it would cost you big bucks. In addition, whenever you run ads, you quickly discover that as soon as you stop paying, you immediately lose your ranking. As you can see, buying ads is truly a “pay-to-play” marketing solution. What’s especially appealing about SEO is that you can receive a steady stream of website visitors for years to come. Regardless of how old your website content is, if no other search result is better than yours, Google will continue to rank you at the top. Despite how challenging SEO is, when it’s done correctly, it really does work. What’s critically important is that SEO offers a level playing field. It’s one of the few marketing strategies where the little guy can compete and win. This means you don’t have to be a major brand to grab your fair share of the market. Over and over again, we see small businesses outranking the big dogs. SEO also has the potential to deliver consistent traffic to your website. Keep in mind, there will always be changes you’ll have to navigate. SEO is always changing because of the never-ending Google algorithm updates. However, what we need to remember is the majority of tweaks Google makes is in response to bad guys trying to game the system. Google’s mission is to provide the user with the best search results. This means the search engine giant works hard to trip up the cheaters. Google simply wants to ensure their users find what they’re looking for. If you align your goals with Google, you’ll be just fine. The longer you delay getting involved in SEO, the more your competitors are getting ahead of you. They will continue to be in the lead until you decide to take the action needed to push them down in the search results. However, you can learn a lot from competitors that are doing it right. Success leaves clues. Which means you can reverse engineer your competitor’s SEO secrets. Once you uncover the strategies they used to climb to the top of the search results, you can adopt those same techniques and take the lead. This form of competitive research is totally legitimate and fairly easy to put into practice. Potential customers are more likely to know, like, and trust a business who ranks at the top of the Google search results. The higher your brand ranks, the more influence you’ll have. When people recognize your brand, you’ll have a greater chance of selling your product and/or services. With all the competition jockeying for attention, it’s getting more difficult to be known for what you do. Therefore, you”ll gain a competitive edge when you are known for who you are. SEO is a great way for you to stand out from the crowd. Can’t Google Just Figure It Out? The short answer is no. Although search engines are very intelligent, they still can’t see and understand web pages the way we do. SEO is what’s needed to help search engines figure out what your web content is about and serve it up to your potential customers. Contrary to public opinion, you do not have to be a rocket scientist to do SEO. 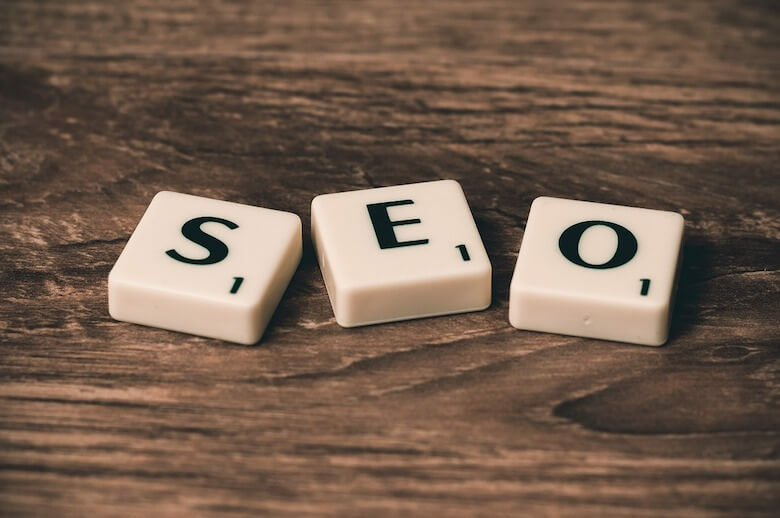 Instead, you just need to follow tried and true SEO strategies that improve your website for both people and the Google gods. If you’re willing to invest the time to learn the skills needed – you can do this. Now of course, I don’t want to sugarcoat this and tell you SEO is a walk in the park. I’ll be the first to admit that SEO does have a lot of moving parts, can be super confusing, and will take longer than you think to master. However, once you finally do “get it”, you will feel empowered. SEO is not going away anytime soon. Therefore it’s not too late to get in the game. As users continue to change their search habits, Google will need to make changes. This is especially true when it comes to new technologies, like voice search. However, no matter what the future holds, the fundamentals of SEO will stand the test of time. There are lots of ways to learn about SEO. You can read books, take courses, or get a mentor (or two). 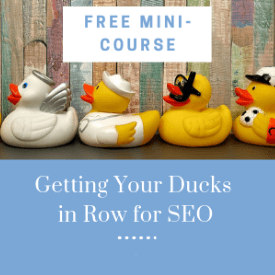 While you can learn SEO on your own like we did, you’ll soon discover there’s a lot to learn. While there’s all sorts of great information on the internet, a lot of it is conflicting. As a result, it’s easy to go into SEO overwhelm. This is probably why so many small businesses end up outsourcing their SEO to an agency. Unfortunately, hiring an agency to run your SEO marketing can be very risky. Not all agencies are created equal. Who can you trust? What are the risks involved? How do you afford the huge fees that good quality SEO requires? 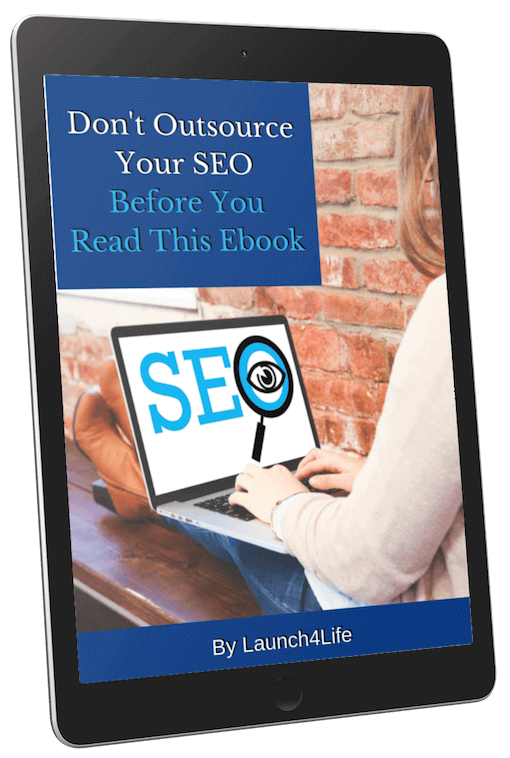 To help you get a leg up, the Launch4Life team has put together a free ebook called: Don’t Outsource Your SEO Before You Read this Ebook. Inside, we outline what you need to consider before turning your SEO marketing over to the “experts”. Our mission is to help small business owners do their own SEO marketing. Instead of doing your SEO for you, we provide DIY coaching. We help small businesses tackle their own SEO in baby steps. If you built your own business, you’ve probably got the ability to be in charge of your own SEO. And even if you do decide to hire an agency to handle your SEO, we can teach you the basics needed to feel confident overseeing the work of anyone you decide to hire. So check out our free ebook and start your SEO journey. Let us help you discover why SEO is important for your business.